Mike Chapman was born in 1947 in Queensland, Australia and moved to the UK where he played with Tangerine Peel. In 1970 he met song writer, Nicky Chinn (born 1945) and they started to write songs together. Nicky was less of a musician and had only taken up an instrument in his mid-twenties. His talent lay in writing pop songs and his previous success with Mike d'Abo (Manfred Mann) included writing songs for the film There's a Girl in My Soup. Mickie Most signed the pair to RAK Records as house songwriters and producers. They specialised in writing hit singles with heavy derived hooks to grasp the attention of the listener. They definitely had the Midas touch and between 1973 until 1978 scored an enviable run of hit singles. Many of their early hits Chinn were conceived and completed overnight. They claimed to create their songs by first thinking of a title, around which they then wrote the lyrics. Their music definitely had mass appeal and younger listeners lapped it up. The intensity of Mike in particular was sometimes the source of friction as most of their groups, outgrew Chinnichap ‘bubblegum’ music. Mike Chapman held a tight grip on the output of the artistes whose works they produced. Keen to reduce production costs, RAK under Mickie Most would frequently use professional session men to play on the records much to the consternation of the instrumentalists in the groups. In the end the means was justified as the hits racked up. Glam Rock was gaining popularity and bands like the Sweet depended upon professional writers to give them catchy works to record. Chin and Chapman did not fail and wrote several a string of hits including "Little Willy", "Wig-Wam Bam", "Hell Raiser", "Teenage Rampage", "Blockbuster!" and "The Ballroom Blitz". When Sweet eventually outgrew bubblegum, the songwriters turned their attention to Mud. More success followed with massive hits like "Tiger Feet" and "Lonely This Christmas". Micky Most discovered Suzie Quatro in Detroit and brought her over to the UK. When he failed to produce a hit he handed the task to Chinn and Chapman and they wrote and produced four hits for the leather clad rocker "Can the Can", "48 Crash", "Daytona Demon" and "Devil Gate Drive" all sold well. Unlike the others, when Smokie came along there were seasoned musicians and Chinn & Chapman decided to move away from their formulaic approach and produced 11 Top Twenty singles for the group. The songwriters had enjoyed immense success in the UK and Commonwealth but the US was more of a challenge. In 1975 they temporarily moved to the US and it took two years before they finally established himself with a number one hit with Kiss you all over, by Exile. At the end of the decade Mike produced albums and singles for Blondie and The Knack. The pair formed the Dreamland record label in 1979 which Chapman ran until it folded after two years later. As the popularity for Glam Rock passed and Punk replaced it, Chinn and Chapman fortunes dwindled. Then in 1982 they had an international hit with Toni Basil and Mickey but by the middle of the decade their partnership was dissolved. Both pursued their separate careers and Nicky Chinn co-wrote "Dancing in the Dark" for Kim Wilde, (1983). 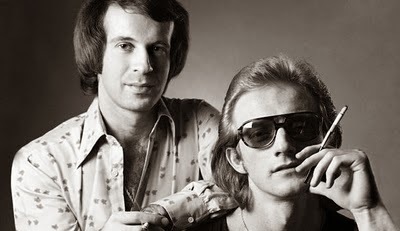 Mike Chapman remained in demand through the 1980s and 1990s as a songwriter and producer. His compositions have included Tina Turner's "Simply The Best" (co-written with Holly Knight), while he has produced albums for Altered Images, Australian Crawl, Agnetha Fältskog, Divinyls, Rod Stewart, Lita Ford, Pat Benatar, Baby Animals, Material Issue and Bow Wow Wow. Nicky Chinn & Mike Chapman were a great pop writing and producing team and could have gone on much longer had Chapman been less challenging and aggressive. Of course Chapman had tremendous success with writing with Holly Knight and developed a different but equally identifiable sound with the Knight/Chapman songs... a kind of rock-pop, strong hooks and melody lines with relationship based lyrics. I think though the whole if often greater than the sum of it's parts and I think Chapman working with Chinn was stronger and more creative than Chapman working without Chinn. Same goes with Chapman working with Knight is stronger than Chapman alone. And no doubt it's the same for Chinn as after the Chinnichap writing partnership folded, Chinn was no longer enjoying life in the charts.. I think Nicky Chinn would be much more of a gentleman and likeable person to the abrasive and boastful style of Chapman. Never the less, they both proved to be brilliant in their jobs as songwriters and producers and millions of people all over the world enjoyed and still enjoy these records.